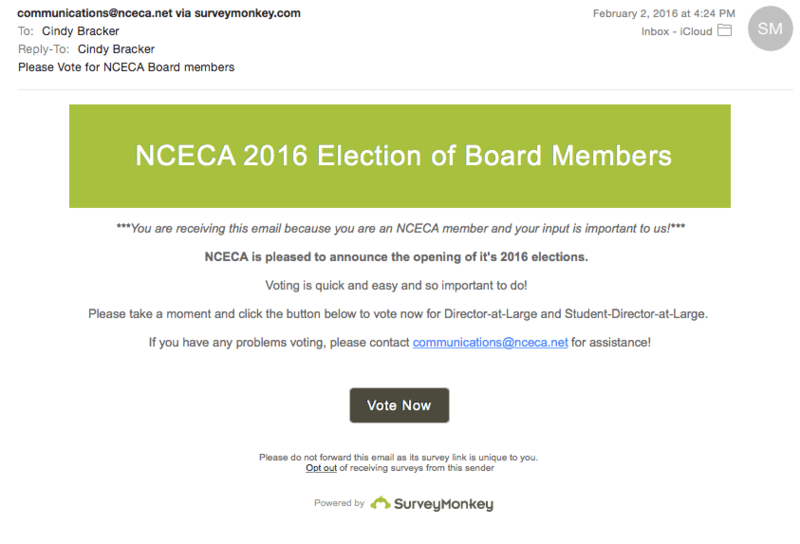 NCECA 2016 ELECTION – VOTING IS NOW OPEN! You may be mired in the unfolding drama of our national election process and keeping up with news of the Iowa and New Hampshire caucuses. NCECA has its own election process and its open for voting and you’ve probably already received an email asking you to vote from our tireless Communications Director, Cindy Bracker! We’re looking to fill two important board positions this upcoming year, Director at Large and Student Director at Large. We have worked very hard to institute online voting and to streamline our voting process. Once upon a time, in order to cast a ballot for you leadership you had to be sitting in a seat at the end of the conference on Saturday, needless to say our turnouts were VERY low. Voting is now open to all NCECA members and your voice is vital in this process. 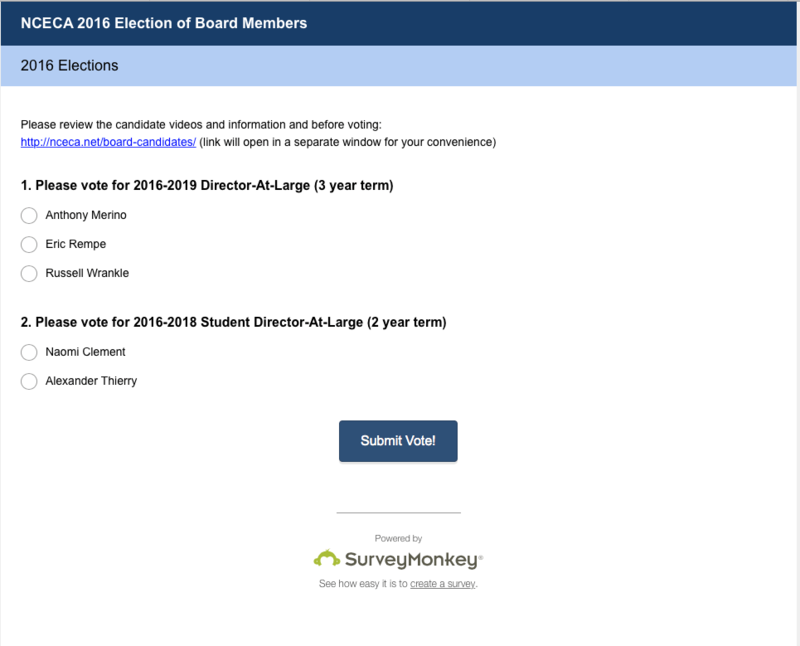 This year we have three stellar candidates, for one open Director at Large position, who would all bring something special to the board. DAL’s work on a number of important projects and participate in board activity and conversations that help to not only plan the conferences but also shape what we know as NCECA. This position is a breeding ground for other positions within the board depending on the strengths of the board member. Anthony Merino, Eric Rempe and Russel Wrankle are looking for your vote! Please vote now. We also have an open position for a Student Director at Large. Aside from their board responsibilities, this position allows us to have a student perspective involved in our conversations and deliberations. Naomi Clement and Alexander Thierry are running for one open SDAL position. Please vote now. We interrupt this announcement from Past President Patsy to bring you the down and dirty details on how to voice your vote! …by we, of course, I mean me…Cindy Bracker. I’m here commandeering Patsy’s post to provide a primer on the procedure. PLEASE NOTE…if you haven’t already familiarized yourself with the candidates, you can click the link right there in the ballot. There are video speeches you can watch OR you can read bios and platforms provided by the candidates) When you are ready, select your candidates and click “Submit Vote” and you’re all done! 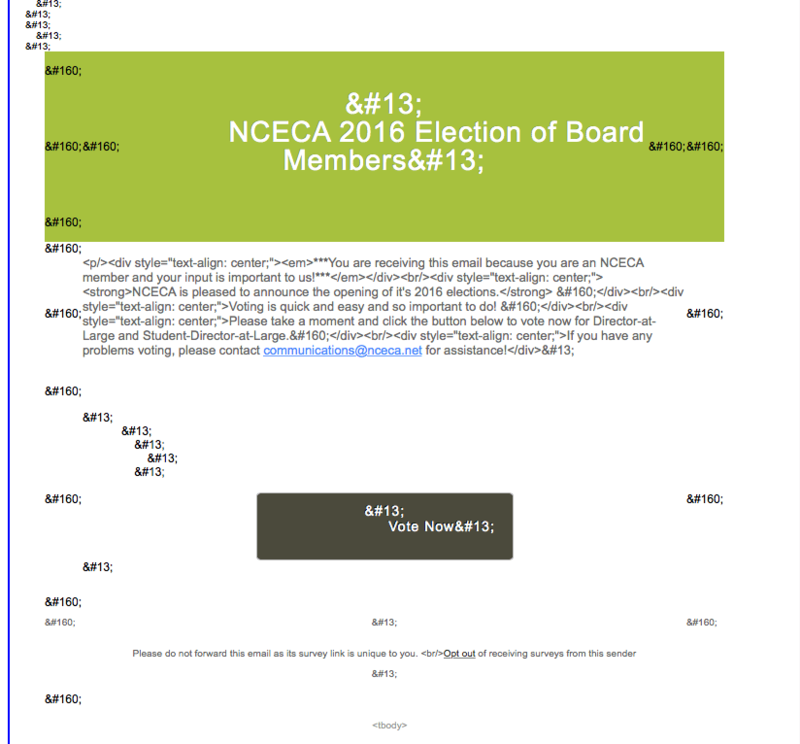 But…..If you get something that looks garbled like the image to the right, or clicking the vote now button does NOT take you to the ballot, please send an email to communications@nceca.net (that’s me) and request a plain text ballot. If you still can’t find anything, you will want to verify your membership. You can do this online by starting here. After logging in, click on the menu item on the left side that reads “My Transactions”, then click “my memberships” and check to make sure your membership isn’t expired. If it is, you can renew right there in the online store, and don’t worry! You will be included in the next batch of ballots which will go out at the beginning of March. 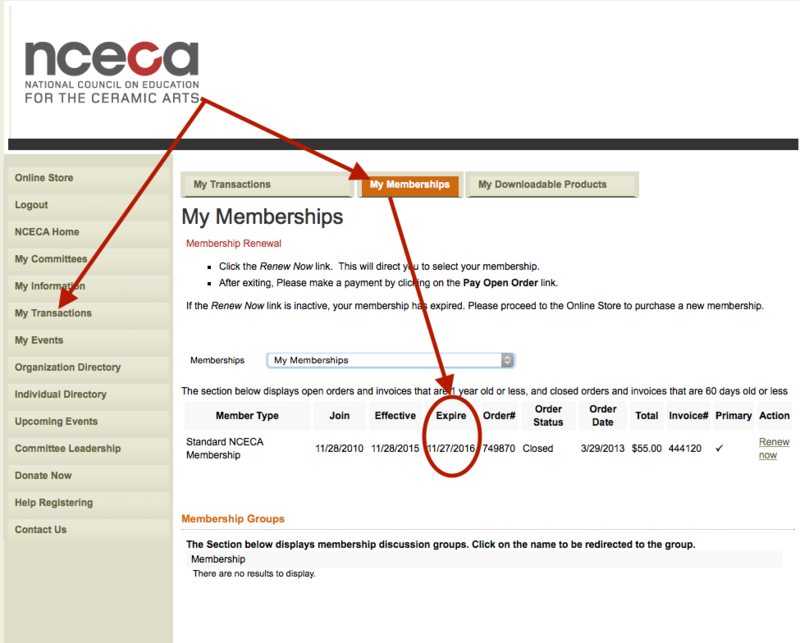 If your membership shows current, please send an email to both membership@nceca.net and communications@nceca.net, and we’ll get you sorted out! …and it IS a lot of you!!!!!! We are well on our way to the highest voter turnout in any NCECA election ever! Thank you for being involved in your NCECA governance.